The thing about volvelles is that not many people write about them. 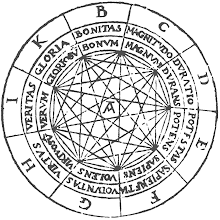 So when I google "volvelles" + whatever I might be poking around for, chances are this blog is somewhere in the results list, as well as few random links to posts on this blog. Which is exactly what happened last night when I found this languagehat.com post from over a year ago. It's on my master's thesis, and embarrassingly flattering. (I had to read it peeking through my fingers and cringing self-consciously.) I tried to post a comment in response, but I couldn't -- perhaps comments are disabled after a certain period of time -- so I decided to use my blogger's prerogative and use this space to thank Steve for the post, and for the kind words. * When you do somewhat strange work -- strange for academia, that is -- the looks of confusion and this-will-never-get-you-tenure talk (though increasingly rare, I've noticed) can be discouraging; so it means a lot to me when someone "gets it." Thanks to the people who took the time to comment, too. Trond Engen, I don't know who you are, or why you insist I was 31 when I finished the thesis; I was 23. Chalk it up to a webby wwwormhole. Some of the challenges to the "novelty" of the project in the comments (and, by the way, I never claimed conceptual novelty: in fact, the thesis itself is an attempt to historicize generative writing) got me thinking about the visual decay of web-based work. If you've ever taught or taken a course on digital literature, you know there's one comment that's inevitable: "It just looks dated to me! Don't they know how far CGI has advanced?" When language dons the dress of design, as it must online, its visual component starts to signify, to make meaning. Of course, written language always has a livery -- we just don't tend to notice it much when it's the utilitarian sweatsuit of Times New Roman text on an 8.5"x11" page. On the web, though, the decoration of links is necessary for navigation. So when a once cutting-edge digital poem written at the height of Netscape's popularity is shown today, it's kind of like watching a Backstreet Boys video on YouTube -- a wee bit "We ♥ the 90s." Various digital pieces play with this nostalgia. I'm partial to the pixelated, NES aesthetic of Neil Hennessey's "Basho's Frogger." What of digital scholarly work, though? The typography and layout of a journal article or monograph age at a glacial pace compared to the design of a web-based essay (although, it's worth pointing out, they do age -- ever looked at a book of lit crit published in the 1940s? ; it even smells uncitable). Most scholars and digital projects seem to err on the side of caution, producing crisp white websites with timeless layouts -- but then they've foregone the opportunity to make the design work rhetorically, which seems to me one of the most exciting possibilities of webtexts. And what of those students who expect digital art to look like the latest and greatest in photorealistic CGI? I'm always stupefied by this comment -- actually, by my own lack of a snappy response. Visual aesthetics carry more weight on the web than they typically do for us in a book; that seems inevitable. It's tempting to say: "Look past the font and colors to what the piece is doing" -- but that's like asking someone to look past the mess of the splatters to get at a Jackson Pollack painting. It's missing the point. Residue from the past clings to digital media even as the present pushes forward with increasing rapidity. In this kind of visual environment, words like "novelty" bump elbows with notions of nostalgia, and linear histories get twisted into spirals. Which is to say: learning to be an attendant reader of new media forms is as much about becoming a careful historian as anything else -- combing through the tangle of texts and colors and designs, new, old and nostalgic, we encounter online. It's also learning to read your feedreader carefully, so you can thank people and respond in, well, a timely fashion. * And my gratitude to Rattus peacay. For a genus with hoarding tendencies, his is a particularly generous species.